Dave Dickenson started his Canadian Football League (CFL) career with the Calgary Stampeders. During his first five years with Calgary, Dickenson participated in two Grey Cups, winning his first in 1998. Dickenson’s best season was during the 2000 campaign, where he was named a CFL and West All-Star, & won the Most Outstanding Player award. Once the 2000 season was over, the National Football League came calling and Dickenson decided to go south for the next three seasons. Before the start of the 2003 season, Dickenson returned to Canada, and became the quarterback for the BC Lions, where he lead BC to a Grey Cup win in 2006. During his time with the Lions, he was top five in the following categories; 4th on the Most Passing Yards in a career with 13,573, 2nd on the Most Passing Yards in a season with 5,496 in 2003, 4th on the Most Passing Yards in a single game list with 509 yards, 3rd on the Most Completions in a single season list with 370, 2nd on the Most Touchdowns passes in a single season with 36, and 1st on the Most touchdown passes in a single game with 6. To finish his career, Dickenson returned to where he started and was a member of the Calgary Stampeders. During his time with the Stampeders, he was top five in the following categories; 5th on the Most Passing Yards in a single season list with 4,636 yards, 5th on the Most Pass Completions in a single game list with 30, 1st on the Most touchdown passes in a single game list with 6, and 5th on the Most touchdowns passes in a single season with 36 in 2000. 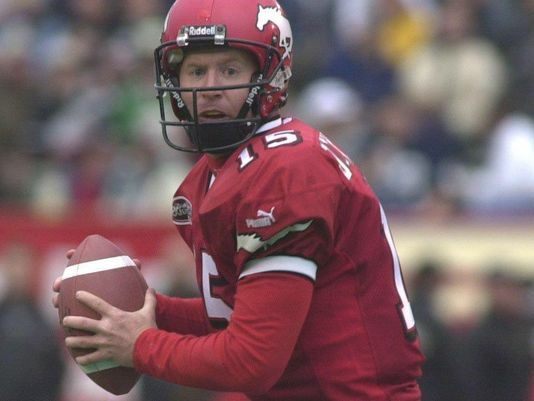 With the team records he obtained, Dickenson was top five in the following CFL categories; 1st on the Highest Pass Completions percentage in a career with 67.5, 2nd on the highest pass completion percentage in a season with 74, and 1st on the highest pass efficiency rating list with 110.4.